One of my last photo shoots in Nepal was with Sierra Magazine. I met and photographed Shogufa, Neki, and Mariam, three girls from Afghanistan, before and after their trek. 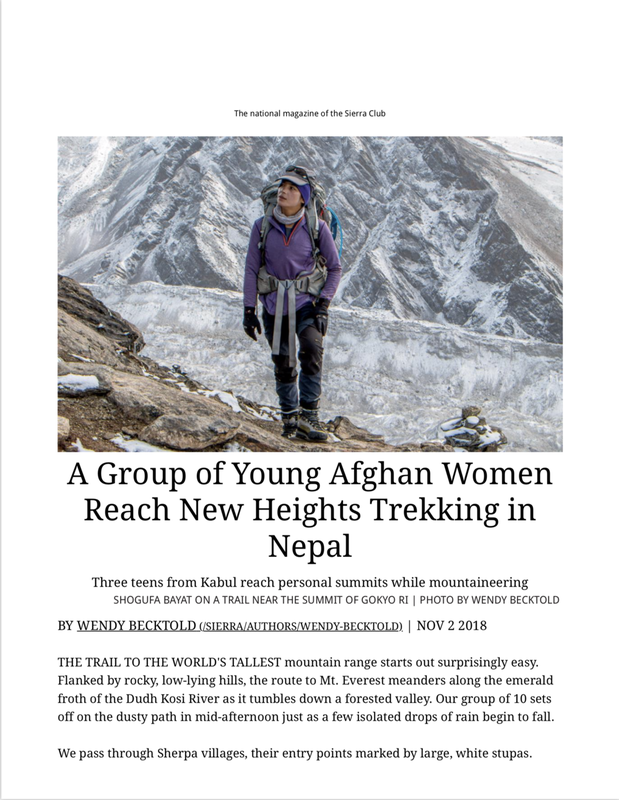 The girls joined Ascend, a nonprofit that trains Afghan girls to climb mountains, and traveled to Nepal to climb to their personal highest ever point 17,770 ft on Gokyo Ri. Spending the day with these girls gave me the most basic understanding of my own privilege and the immense freedom I have enjoyed as an American woman. As always my camera offered me an entry point by learning about a world totally different then my own. Be sure to read the full story of Shogufa, Neki, and Mariam’s journey below as told by the talented Wendy Becktold. You can read the online version of this story at Sierra Magazine. Please note: Not all the photographs in this article are mine. Many belong to the Wendy Becktold who traveled with the girls for the entirety of their journey. I believe that compassionate storytelling has the power to create change in the developing world. I share compelling narratives, improve the quality of media, and empower people from around the globe. ©Kea Dupree. All Rights Reserved. I’m a professional photographer and multimedia storyteller. I primarily work with nonprofits and international organizations to share their stories. My approach is creating vibrant, honest, and emotional photography.